Cologne Cathedral, constructed over more than six centuries, has an exceptional intrinsic value and contains artistic masterpieces. It is a powerful testimony to the strength and persistence of Christian belief in medieval and modern Europe. Christians met for worship in a private house in Roman Cologne near the city wall. Following the Edict of Milan in 313, when Constantine proclaimed religious freedom, this building was enlarged as a church. Alongside it was an atrium, a baptistry, and a dwelling-house, possibly for the bishop. This modest ensemble was extended and enlarged in the following centuries. This immense building, known by the 13th century as ‘the mother and master of all churches in Germany‘, was consecrated in September 70. Post-Second World War excavations, as well as contemporary documents, provide evidence of its form and decoration – a basilica, with a central nave flanked by two aisles and a large atrium in front of its western facade. A two-storeyed Chapel of the Palatinate, in the style of Charlemagne’s chapel in Aachen, was added to the south transept at the beginning of the 11th century, and later that century it was connected by two lofty arcades at the east end with the Collegiate Church of St Mary ad Gradus. 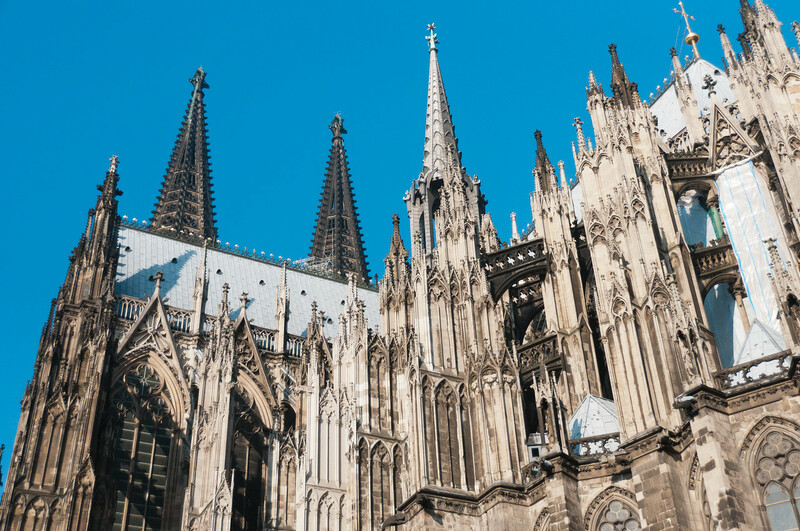 The Cologne Cathedral is one of the most iconic symbols in all of Germany and certainly the most well known important religious building in the country. 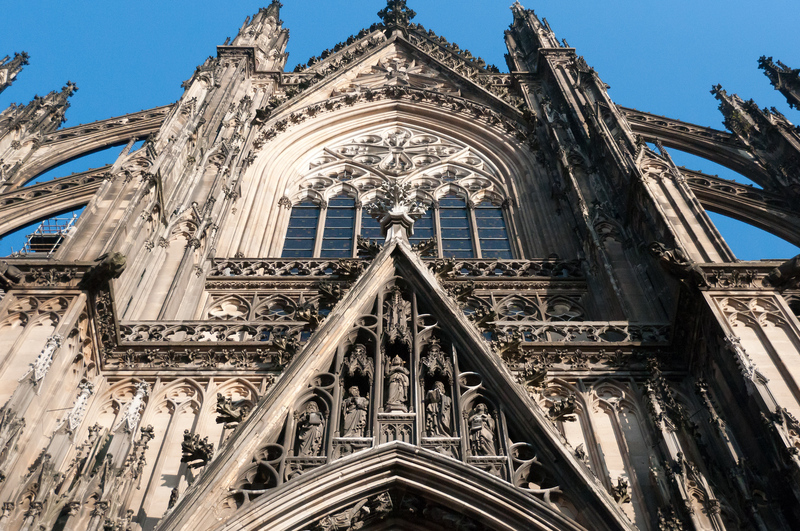 It towers above the city of Cologne as one of the largest and most important Gothic cathedrals ever built. The moment you walk out of the Cologne Central Train Station you are immediately struck by the enormity of the cathedral staring at you. The fact that it is on a hill and the train station is situated below it only adds to the effect. Thankfully, the cathedral escaped any serious damage in WWII. It has been in a state of almost constant renovation ever since. The cathedral was originally built as a resting place for the remains of the three wise men who were stolen from the cathedral in Milan. Today, the city flag of Cologne has three crowns on it, representing the three wise men. The reliquary of their bones in the back of the church behind the altar. Cologne Cathedral is a Roman Catholic Church located in Cologne, Germany. To this day, this cathedral is still in use. It is a cultural UNESCO World Heritage Site in Germany that was inscribed in 1996. In 2004 to 2006, it was listed as among the World Heritage Sites in Danger. The cathedral features a Gothic architectural style. The construction for the Cologne Cathedral started in the mid-13th century. It was again reconstructed in the 1840s to the 1880s. A final period of restoration was done on the church in the 1950s to 2005. This cathedral serves as the seat of the Archbishop of Cologne and is considered a monument of German Catholicism, as well as that of the Gothic architecture. On top of that, this cathedral is the most visited landmark in Germany with about 20,000 tourist visits per day. 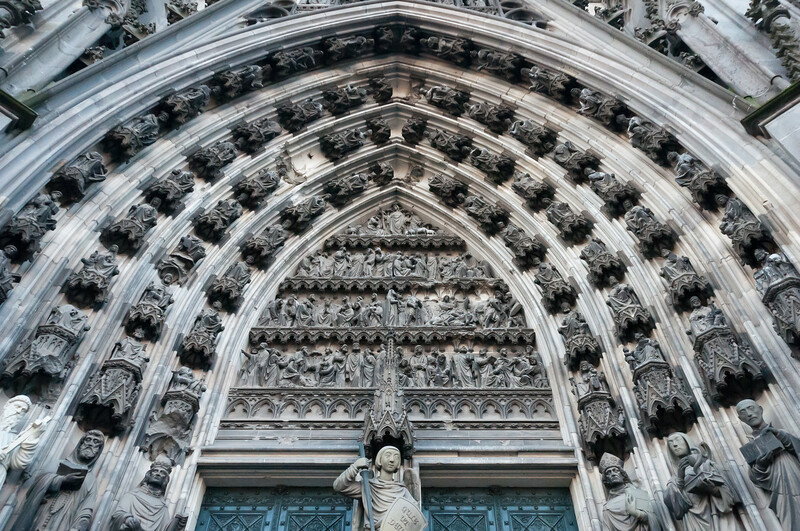 The architectural design of the Cologne Cathedral was loosely based on the Amiens Cathedral. The plan for the cathedral follows the shape of a Latin Cross, which is typical of Gothic churches. This cathedral features one of the highest Gothic vaults there is, which is why there are two aisles located on either side of the cathedral to provide additional support. 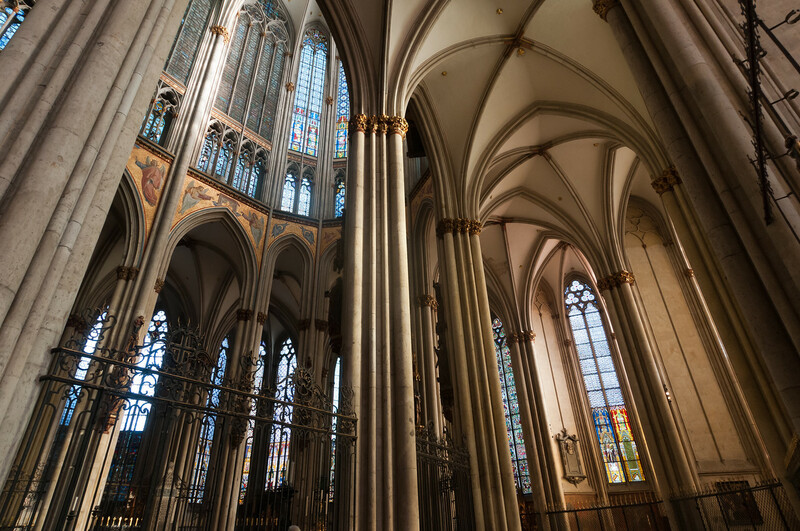 The nave for the Cologne Cathedral features 19th century stained glass windows. And on the outside, the cathedral is dominated by huge spires that are highly Germanic in character. Aside from the unique architectural details of the church, the treasures contained inside of it are part of the many reasons why it is considered of cultural heritage value. The High Altar is one of the many treasures within this Gothic church. This altar was put into the church in 1322. The altar is made out of black marble and a solid slab that forms the top. The sides and front of the altar feature white marble niches. The Coronation of the Virgin figure is located at the center. There are also many celebrated artworks within the church. One of the most celebrated of these artworks is the Shrine of the Three Kings. This was built from 1167 to 1191 by Nicholas of Verdun. Another notable work of art inside the church is the Gero-Kreuz. This is a large crucifix that is made from oak while featuring traces of paint and gliding. It is believed to be the earliest large free-standing sculpture from the medieval period. It is also the largest and oldest crucifix located north of the Alps. This cathedral can be seen from nearly any point in the city center of Cologne. It is the second highest building in Cologne. It can accommodate up to 20,000 people. In 2004, it was listed as one of the UNESCO World Heritage Sites in Danger due to plans of constructing high-rise buildings nearby. These plans threatened the heritage value of the cathedral. In 2006, it was removed from the list after the limit to the height of the construction was set. Not only is Cologne Cathedral a UNESCO site, but it is also one of Germany’s major tourist attractions. Many of those who travel to this site are on a Christian pilgrimage. In addition, visitors who come to the cathedral climb the 533 stone steps leading up to the spiral staircase and onto a viewing platform. This platform is located 100 meters above ground. As of 2017, bags are banned inside the cathedral following the recent terrorist attacks in Europe. Visitors who carry bags are not allowed to enter the cathedral. You captured a lot of detail in the building- love it! I absolutely love the cathedrals of Europe. I’ve visited quite a few of them over the years, but keep coming across others I want to see also. This Cologne cathedral is beautiful. I’ll have to remember to stop here when I can.